If you love to decorate for baby showers, you do not want to miss this course. Here you will learn to create adorable arrangements to welcome the little bundles of joy. Our program does not compare to others as this is not a seminar where a large group watches the teacher, makes balloon designs, Our aim is to put you in a successful business or increase your current business with new designs that you get to practice in class. Baby showers are growing in popularity by the minute. 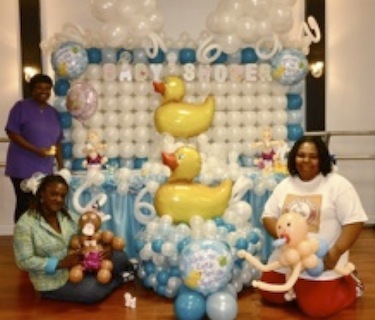 New trends are making baby showers more widespread. Increase your sales by knowing all the tips & trick for an unforgettable baby shower. Learn how to sell decor with a purpose and amaze your clients with unique pieces. 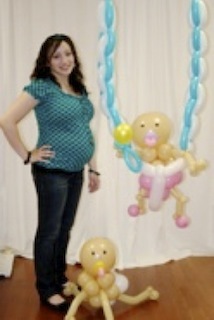 Our classes are geared for people who wish to do baby shower decorations. This is a great class for those that wants to add a different designs to this up coming traditional event. This hands-on class will help you make the decor and backgrounds joyful to transform that special baby shower into a unforgettable event. The goal is to help you sell decoration with a purpose. This course is full of cuteness, Increase your sells by knowing all the tips & trick for an unforgettable baby shower. Learn how to sell decor to enhance the theme and event. This course includes adorable pieces that can be used for baby showers, centerpieces and or delivery pieces. They make a great welcome baby gift too! You will be so proud of your creation and you will be hooked on the extremely cute designs! Our classes are geared for people who wish to do baby shower decorations and decor packages. This is a great class for those that wants to add something different to their designs and business. This course is full of cuteness, and you will learn designs for balloon arches, columns, centerpieces and adorable sculptures to welcome the bundle of joy. Increase your sales by knowing all the tips & trick for an unforgettable baby shower. Learn how to sell decor with a purpose. This hands-on class will help you make super cute decor and backgrounds to transform that special party into a dream come true. Knowing the new trends in this market is a must, and we help make the magic happen. Our classes are focused on techniques and unique designs using the latest products on the market. This class will focus on mixing fabric, balloons and floral designs to make very unique designs.